HMGP Application Review Checklist to ensure application requirements are met. The National Earthquake Technical Assistance Program (NETAP) is FEMA’s program for delivering earthquake education and awareness training to the public. NETAP helps State, local, and Indian tribal governments, non-profit organizations, and the private sector obtain the knowledge and tools needed to plan and implement effective earthquake mitigation strategies. There is an often-repeated saying, “Earthquakes don’t kill people, buildings do.” Although you can’t control the seismic hazard in the community where you live or work, you can influence the most important factor in saving lives and reducing losses from an earthquake: the adoption and enforcement of up-to-date building codes. Evaluating older buildings and retrofitting structural and non-structural components also are critical steps. To survive and remain resilient, communities should also strengthen their core infrastructure and critical facilities so that these can withstand an earthquake or other disaster and continue to provide essential services. Recent earthquakes remind us that we live on a restless planet. But there are many important things we can do before, during, and after an earthquake to protect ourselves, our homes, and our families. This fact sheet provide information about residential safe rooms and explains that a safe room is a room or structure specifically designed and constructed to resist wind pressures and wind-borne debris impacts during an extreme-wind event, like tornadoes and hurricanes, for the purpose of providing life-safety protection. FEMA Hazard Mitigation Assistance (HMA) has introduced a new document, the HMA Application Review Tool (ART) Version 1.0, which has a two-fold purpose. It is both an instrument to facilitate FEMA’s review of HMA subapplications as well as a transparent reference to guide State Applicants and local communities in developing more complete HMA grant applications. The goal of the HMA ART is to further reduce the uncertainty of Applicants and FEMA reviewers on the level of completeness of an application. Established by Congress in 1977, the National Earthquake Hazard Reduction Program (NEHRP) works to reduce risks to life and property resulting from earthquakes. Focusing on research, building code standards, technical guidance, and education, NEHRP is a collaborative effort among the Federal Emergency Management Agency (FEMA), the National Institute of Standards and Technology (NIST), the National Science Foundation (NSF), and the United States Geological Survey (USGS). Mitigation is the effort to reduce the loss of life and property by lessening the impact of disasters. A recent study by the Multihazard Mitigation Council shows that each dollar spent on mitigation saves an average of four dollars. 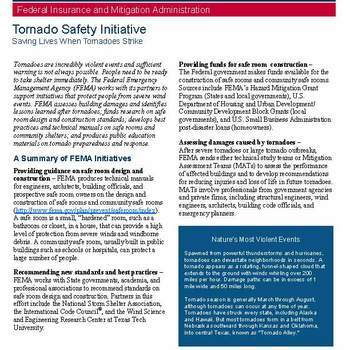 FEMA’s Federal Insurance and Mitigation Administration (FIMA) implements numerous Congressionally-authorized programs that address the effects of natural hazards through mitigation activities. Fiscal Year 2014 Pre-Disaster Mitigation Fact Sheet. This fact sheet is intended to provide information on the Office of the Flood Insurance Advocate. The Office advocates for the fair treatment of policyholders and property owners by providing education and guidance on all aspects of the NFIP, identifying trends affecting the public, and making recommendations for program improvements to FEMA leadership. Even a slight chance of flooding can pose too great a threat to the delivery of services offered by the maintenance and operation of a community’s critical facilities. Special consideration when formulating higher regulatory standards and floodplain management plans needs to occur when critical facilities are involved. This Fact Sheet provides Homebuyers with general information about the National Flood Insurance Program and the importance of knowing a home’s flood risk and associated flood insurance options. This Fact Sheet provides an overview of the expedited and unified interagency review process that will ensure that disaster recovery projects comply with environmental and historic requirements under Federal law. The Additional 5 percent Initiative is funding that has been set aside to help communities enhance disaster resilience related to building codes, such as adopting the current International Building Code® and improving a community’s Building Code Effectiveness Grading Schedule (BCEGS) score.